Anita helped me with the introduction of a new cat when things were a little stressful; she was always on hand, incredibly supportive and reassuring and helped me understand and interpret my cats behaviours and see the positives. 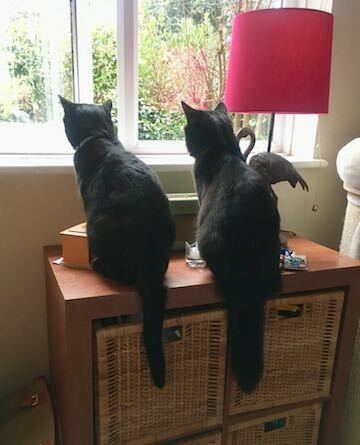 I now have 2 very happy cats (and a happy cat owner!) after introducing her suggested changes and techniques. I thought I knew cats after years of owning a variety of challenging characters, but introducing 2 cats is a very different road and I am so glad to have had Anita’s support. Are you seeking expert advice cat introductions? If the answer is yes then please contact Anita on info@catbehaviourist.com. Anita’s consultancy is vet referred but once she gets a referral you will be given a home visit as soon as possible, usually within a week or less. You can be assured of a first class service where you will be treated with compassion and understanding and not judged. Cat introductions need to be caught early, should problems arise. They need professional help and benefit most from a home visit where expert advice can be give.